The best multi-purpose paper choice for all your copy needs. Econosource is a unique balance of reliability and value. A trusted domestic copy paper brand that stands out with even the most demanding reprographic requirements. 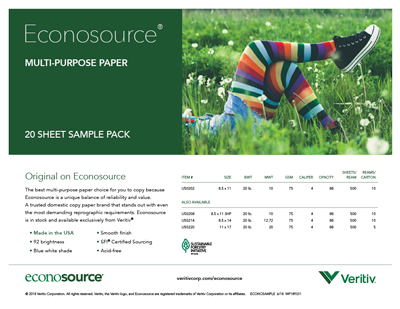 Econosource is in stock and available exclusively from Veritiv®. © Veritiv Corporation. All rights reserved. Veritiv, the Veritiv logo, Econosource and the Econosource logo are registered trademarks of Veritiv Corporation or its affiliates.